Now, I will admit that this is going to be more of a discussion of my experiences exploring this problem and, if you get lucky, I might come up with a recommendation somewhere toward the end. The problem presents a rather interesting set up: filling up circles with pennies, making predictions, modeling with data, best fit functions. Lots of different entry points and possible rabbit holes to get lost in. First change was that my circles were not created by radii of increasing inches. For the record, I can’t quite explain why I chose to make that change. Instead, I used penny-widths. Circle one had a radius of one penny-width. Circle two’s radius of two penny-widths. Circle three’s radius… you get the idea. 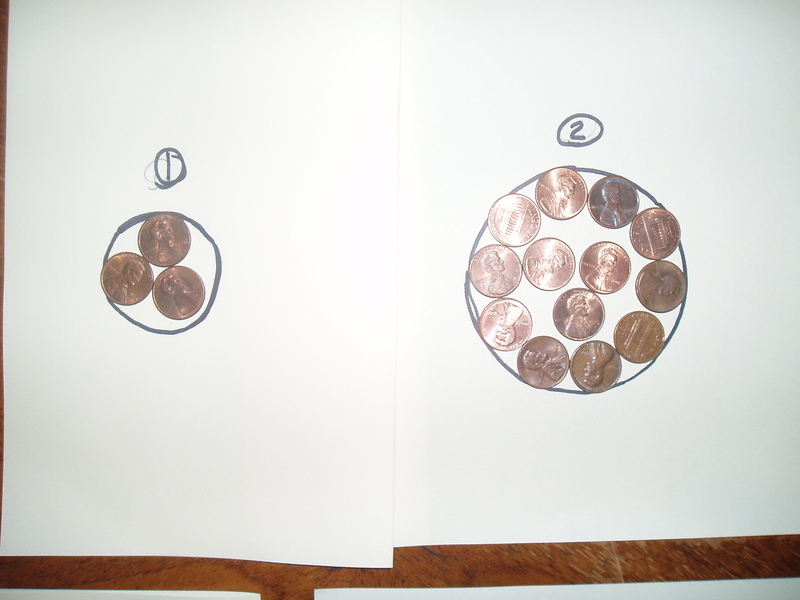 I started with 4 circles with radii based on penny width. Note: I understand the circles look sloppy. I had wonderful, compass-drawn circles ready to go and my camera wasn’t playing nice with the pencil lines. So, I chose to trace them with a Sharpie freehand, which… yeah. 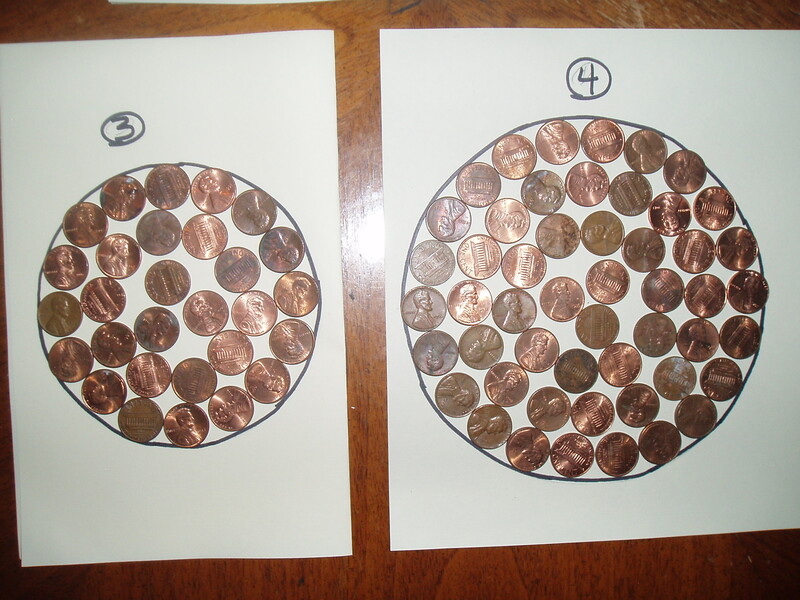 Next, I kept the part of the problem that included filling each circle up with pennies. Here’s where the fun began. I saw a handful of different interesting patterns that were taking place. If we stay with the theme of the original problem, then we’d be comparing the radius of each circle to the penny capacity, which would be fairly satisfying for me as an instructor watching the students decide how to model, predict, and then deciding whether or not it was worth it to to build circles 5, 10, or 20, or if they can develop a way to be sure of their predictions without constructing it. But, I also noticed that by switching to the radius measured in penny-widths, the areas began to be covered by concentric penny-circles. So, we could discuss how predicting the number of pennies it would take to create the outside layer of pennies. Or we could use that relationship as a method for developing our explicit formula (should the students decide to do that). So, if I am designing this activity, I feel like the original learning targets are too focused and specific. I want the students to be able to use inductive reasoning to predict. Simple as that. If they find that using a quadratic model is the most accurate, then cheers to them, but this problem has so much more to offer than a procedural I-do-you-do button pushing a TI-84. First, I’d start with them building their circles using a compass and some pennies. Build the first four and fill them in. I’m quite certain that the whole experience of this problem changes if I leave the students to explore some photos of the my circles. They need to build their own. Plus, that presents a low entry point. Hard to get intimidated lining up pennies on a paper (although, I have plenty of student intimidated by compasses). Next, I think that I would be if I simply asked them to tell me how many pennies they would need to build circle five and to “prove” their answer, I believe we would see a fair amount of inductive reasoning arguments that don’t all agree. The students battle it out to either consensus or stale-mate and then we build it and test. It should be said, though, that as they are building the first four and filling them in, I’d be all ears wandering about waiting for the students to make observations that can turn into hooks and discussion entry points. Then I would drop circle ten on them and repeat the process. This is where the students might try to continue to use iterations if they can figure out a pattern. 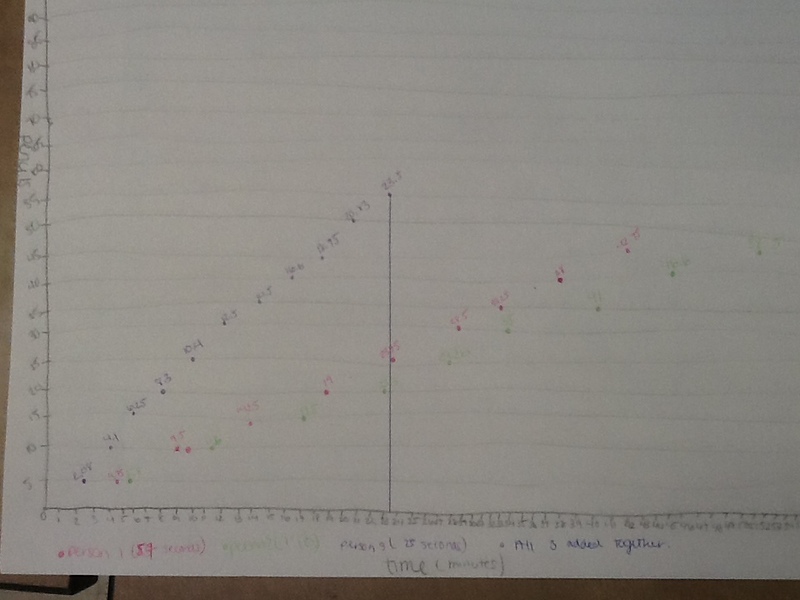 Some will model with the graphing calculators (in the style the original problem prefers). I’m not sure that I have a preference, although I would certainly be strategic in trying to get as many different methods discussed as possible. Then, when they have come to an agreement on circle ten, I’d move to circle 20 and offer some kind of a reward if the class can agree on the right answer within an agreed margin of error. Then, we’d build it and test (not sure of the logistics of that, but I think it’s important). 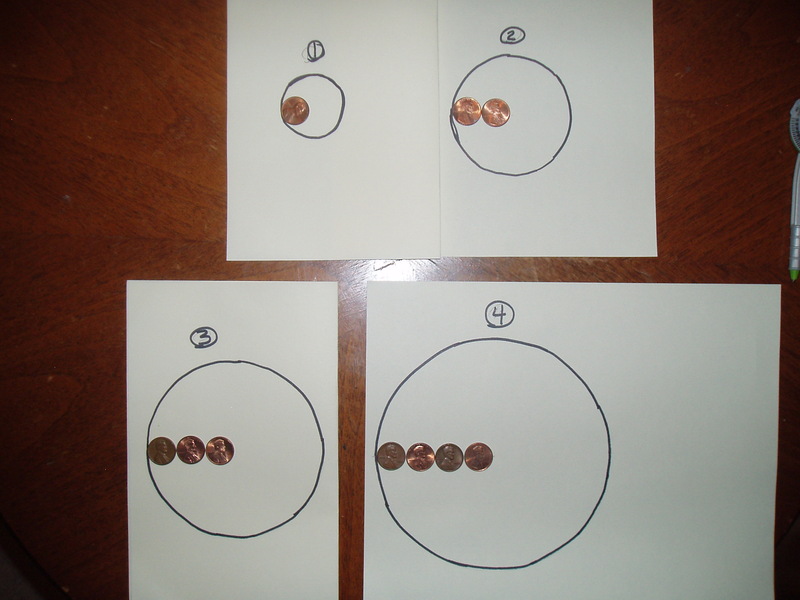 All that having been said, I see an opportunity to engage this in a different manner by lining the circumference of the increasingly-bigger circles with pennies so that the circle was passing though the middle of the pennies and seeing how, as the circles got bigger, how the relationship of the number of pennies in the radius compared to the number of pennies in the circumference. I suspect it could become an interesting study on asymptotic lines. You know, I was talking to a colleague yesterday and he was commenting on the ways that he is trying to keep skills from previous math classes fresh by integrating a variety of skill sets into the problems he assigns. I liked that idea. I teach geometry and algebra both. Some of the geometry gets taught before Algebra I, so it get me thinking about ways I could combine the two in away that pushes the skill sets of both, but doesn’t have the same feel as the typical practice problem. So, consider this: Plot four linear functions so that there is a triangle in each quadrant. The smallest triangle is in quadrant 1. The next biggest is in quadrant 2. The next biggest is in quadrant 3. The next biggest is in quadrant 4. Also, design your triangles in such a way that the area of the triangle in quadrant 1 is exactly half the area of the triangle in quadrant 3 and the area of the triangle in quadrant 2 is exactly half the area of the triangle in quadrant 4. Once you have your triangles drawn, find the equations for the four functions you drew to create your triangles. What could be the next steps in this problem? What can we do with the drawing that we have in front us? What do you think? 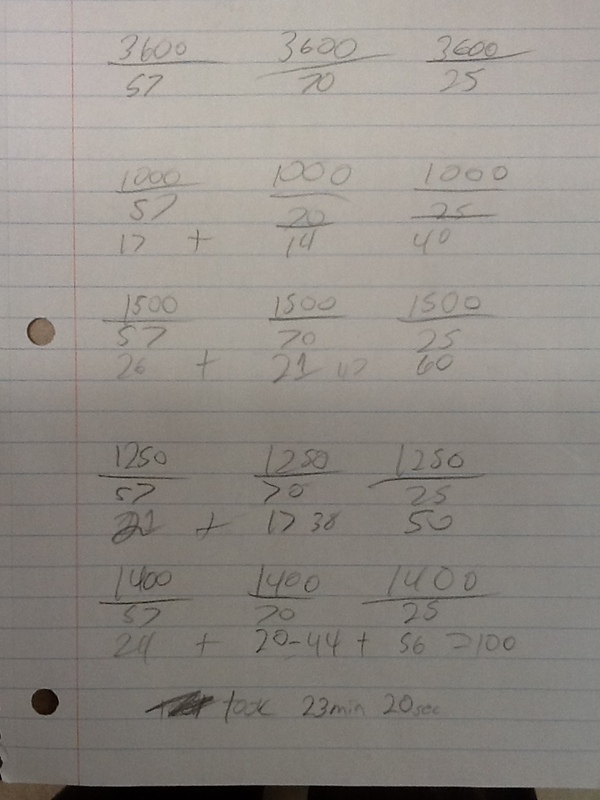 2. a way to verify their answer. As long as the solution process included those two things, the students ended up fairly successful in the process of this problem. In this first one, shown above, this pair of students decided to draw a floor plan with each of the pencil sharpeners (and the bucket they were tossing their leftover pencil nubs). The solution process progressed from there. These two students are classic minimalists. They worked to guess-and-check, which requires a bit more skill than it might seem. They needed to decided what number they were going to guess (sounds like an independent variable) and how to check their answer (sounds like a function producing a dependent variable). They weren’t using the vocabulary. It didn’t seem to be a problem for them. These two were a little more formal with their guess-and-check process, and they were using the terms independent and dependent variable. 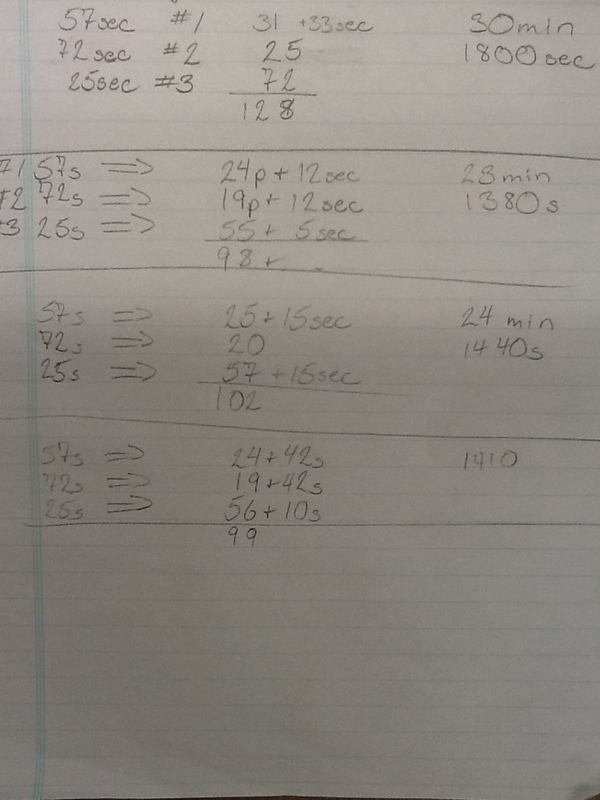 For the record, the time was independent and the number of pencils sharpened was the dependent variable. 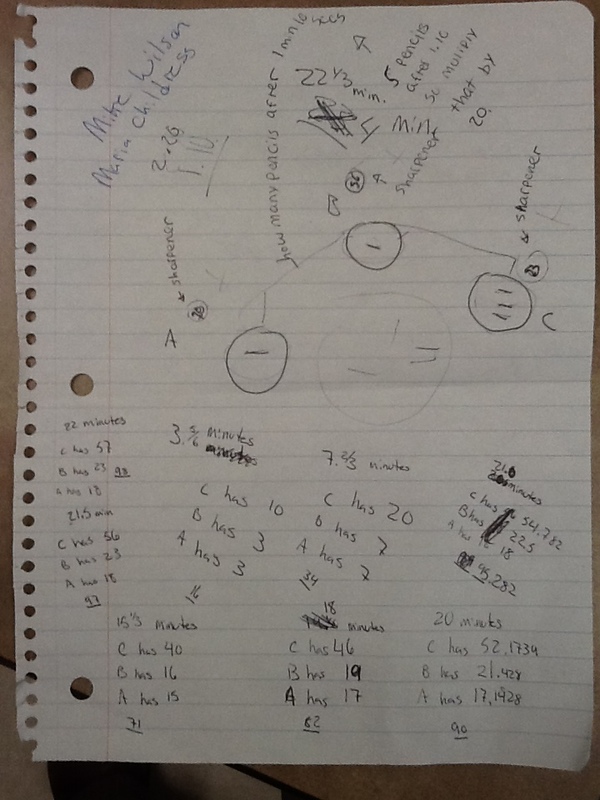 Each of these students would have likely looked at the others with confusion, yet their answers largely agreed. What it required for them to solve it wasn’t me, as teacher, telling them how. On the contrary, it required me, as facilitator, designing a problem they would engage with and then giving them the resources to make sense of the problem with each other. Let’s start with a student sharpening a pencil as quickly as he can. Let’s add a second student sharpening a pencil as quickly as he can. And then, we’ll add one more student sharpening a pencil as quickly as he can. If all these guys kept going at the same rate they were in the video, how long would it take for them to grind away 100 pencils? So, I ended the unit on Linear Functions with a problem relating to the videos below. 2. A 150-lb person running 7.5 mph. I’ll report back with the results. You’ve got an idea? treadmill video #1 from Andrew Shauver on Vimeo. Treadmill Video #2 from Andrew Shauver on Vimeo. Treadmill Video #3 from Andrew Shauver on Vimeo.